Annette Peterson is an oil painter who has both studio and plein air approaches to her practice. 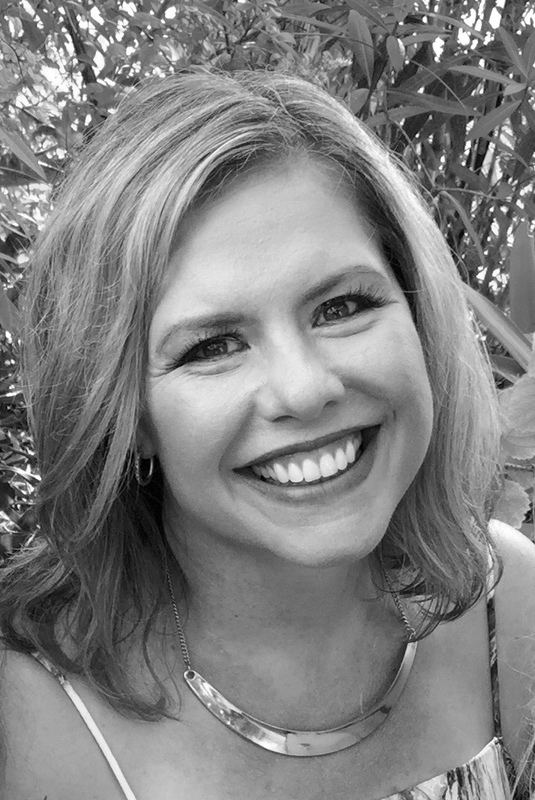 Annette Peterson was born in Stavanger, Norway. 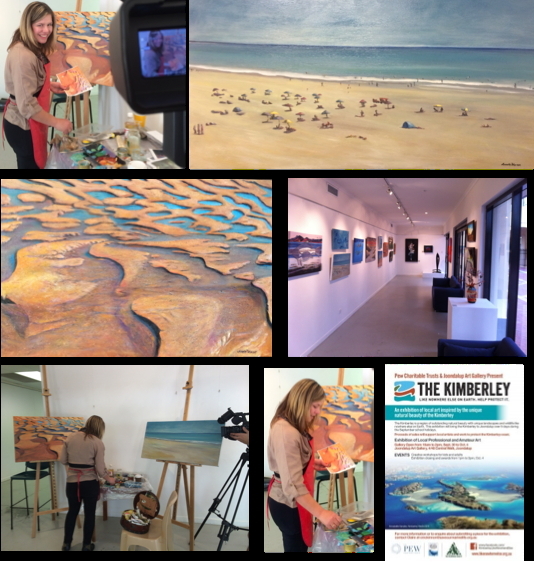 She is an oil painter who has both studio and plein air approaches to her practice. She utilises photography and painting techniques to facilitate both realistic and impressionistic style landscape paintings. Peterson, who grew up in Perth, is most influenced by changes in light and atmosphere on everyday suburban street scenes. Peterson finds art important because it can communicate those day-to-day moments in life that are significant but are often overlooked. 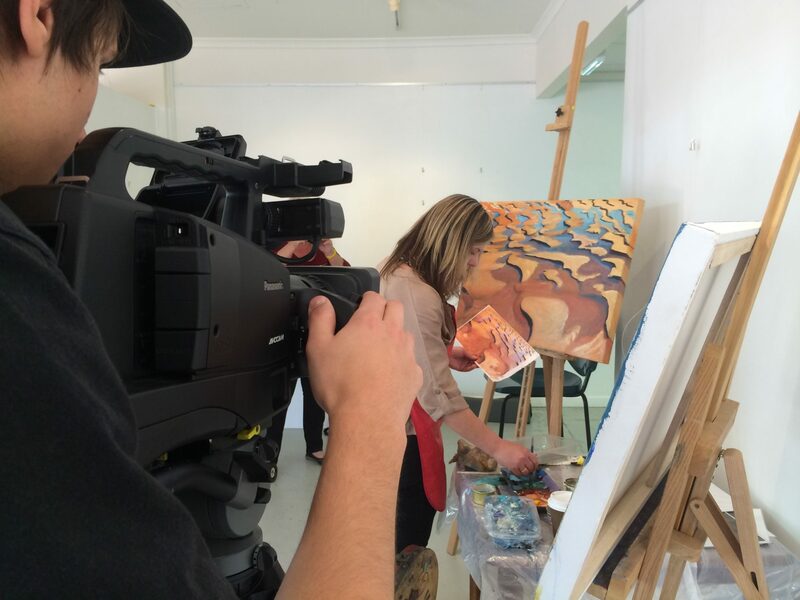 Peterson began painting in 2007, after working as a journalist in the Pilbara. She won categories for painting in the Hedland Art Awards from 2007 for three consecutive years. 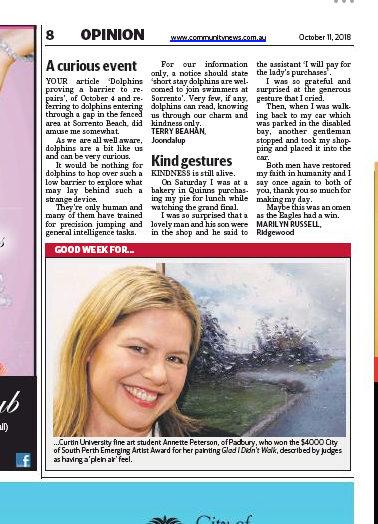 She returned to Perth in 2010 and has since won the popular choice (2012) at the Joondalup Art Awards. In 2016, she achieved an award for highest results for Humanities, while studying a Graduate Diploma for Art and Design at Curtin University. Peterson graduated with a Masters of Applied Design and Art at Curtin University, with Distinction, 2017, where she won the Art Award from her Master’s artwork. 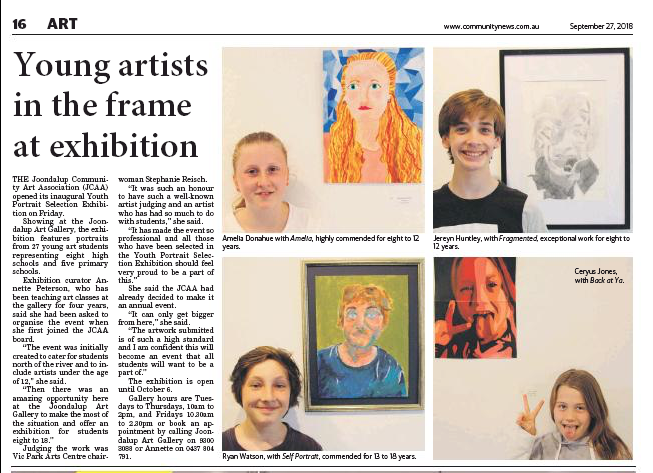 In 2018, Peterson is currently completing Honours in Fine Arts at Curtin University and has just won the 2018 South Perth “Emerging Artist Award.” Earlier in the year, she also won the Celebrating Joondalup Award,” at the recent Joondalup Community Art Awards. 2017 Masters in Applied Design and Art (Visual Art) With Distinction. Curtin University. 2016 Grad Certificate in Art and Design, With High Distinction. Curtin University. 1997 Bachelor of Arts: Majors Psychology, English Literature, UWA. 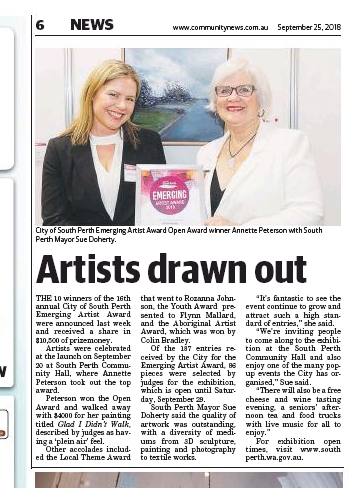 2018 Emerging Artist Award, City of South Perth Emerging Artist Award.